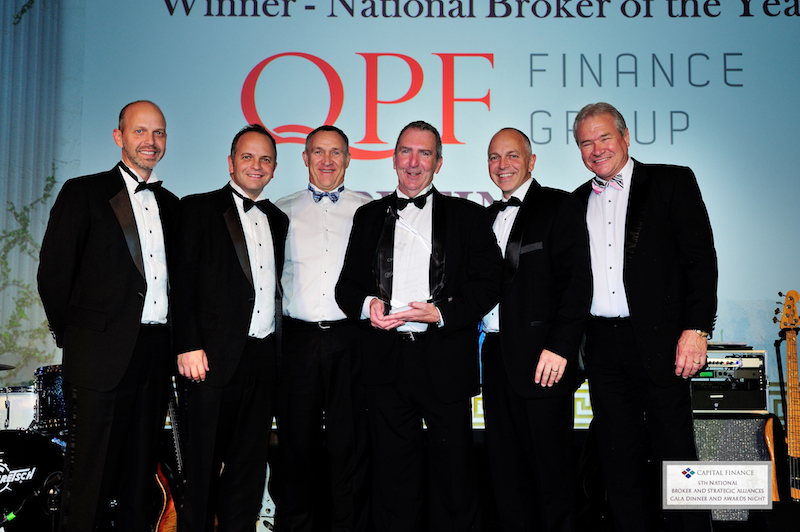 Capital Finance held their fifth annual Broker of the Year Awards on the Gold Coast on Friday 11th July, where QPF Finance Group was awarded National Broker of the Year. This is the second time QPF has received this prestigious award in the five years since the awards began. Capital Finance (CFAL) is one of Australia’s largest motor vehicle and equipment financiers. Their 2014 Awards night was held at the glamorous Palazzo Versace Resort and QPF Directors Mark Crain, Andrew Crain, Matthew Crain, Peter Schampers and Ken Gordon graciously accepted the award on behalf of the group. QPF Director Mark Crain says the team at QPF is pleased to receive this award as it further demonstrates the group’s effectiveness in successfully executing and settling deals in high volumes. “We aim to align with lenders who share the group’s core values and our strong partnership with Capital Finance is a great example of this,” he said. CFAL said the awards were not only based on volume and profitability, but also on ‘ease of doing business’. They sought feedback from their credit, settlements and admin staff on how professional and respectful QPF’s interactions were with their staff. QPF also took out the Queensland Broker of the Year award for the fourth year running. The Directors of QPF would like to thank everyone that contributed to these results – not only all brokers, but also the credit and admin teams.